Tonight at 9PM EST/6PM PST, “JEK III Productions” presents a big “Mayweather vs. Maidana” edition of “The Pugilist KOrner’s: Weekend Wrap”!! Throughout the first thirty minute segment of the two hour program, The Pugilist KOrner team will talk about last night’s Welterweight unification bout between Floyd Mayweather Jr. and Marcos Maidana from Las Vegas, Nevada, as well as Amir Khan’s victory over Luis Collazo, and Adrien Broner’s win against Carlos Molina. At the half hour mark of the show, “The Pugilist KOrner’s: Weekend Wrap” is honored to feature elite level trainer Ronnie Shields!! The Houston, Texas based fight coach will talk about the last night’s fight card from the MGM Grand in Las Vegas, Nevada, and the future of Mayweather, Maidana, Khan, Collazo, Broner, and Love. Mr. Shields will also discuss the press tour, featuring his fighter Erislandy Lara and former WBC/WBA Junior Middleweight Champion Saul “Canelo” Alvarez. In the final segment of the evening, we’re proud to feature master strategist James Gogue on “The Pugilist KOrner‘s: Weekend Wrap”. 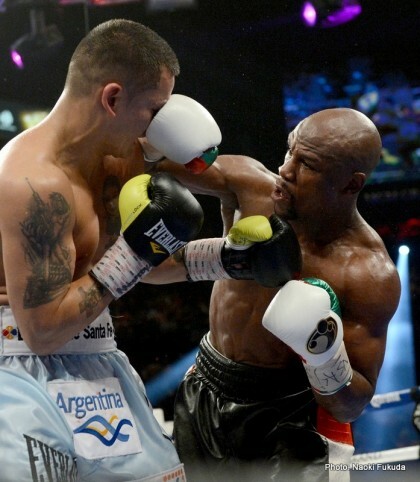 The three decade boxing coach will examine last night‘s epic battle between Mayweather and Maidana, as well as the match-up between Khan and Collazo in the co-main event. Gogue will also talk about the pre-fight “MX Everlast” controversy between Team Mayweather and Team Maidana, and explain what the real issue was all about.